I n his book, Anabolics 2002, Bill Llewellyn says that Cytomel is not a drug to start off on, and that use of milder drugs like T4 (Synthroid) or triacana can help ease a person into the use of T3. I'm inclined to disagree here however. Triacana is weak compound and I find of little use. Its not easily found anymore and not cheap either. T4 is basically similar to Cytomel except that its weaker. 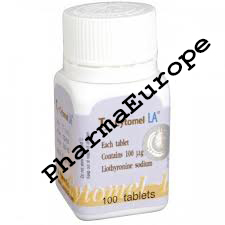 Something that users normally compensate with higher doses and sends them down a similar lane as simply using cytomel. Agreed, cytomel is NOT a drug for beginners, but with adequate research, experience with diet and some self-control, I don't see why cytomel shouldn't be the first thyoid compound used. But for recreational users looking for a fatburner, I still suggest using clenbuterol over cytomel for all intents and purposes. Cytomel is much more powerful, but clenbuterol is a lot safer for use. The results are easier to maintain with clenbuterol as well. Negative feedback in the thyroid may decrease natural levels of T3 in the body, causing a decrease of metabolic rate after coming off a cycle of T3. That can cause a rebound effect during which a lot of weight is gained back.